Amelia Earhart embarked on her ill-fated, round-the-world flight 80 years ago and never returned. I feel fairly confident in saying that, despite any reports otherwise, she most likely died on an island in the Pacific as a castaway. However new evidence has emerged—like it does every year!! !—that she survived. NBC News reports that a recently-discovered photo shows almost-definitive proof that Amelia Earhart and her navigator, Fred Noonan, might have been taken into captivity by the Japanese. The photo in question is at the center of a new History Channel documentary airing Sunday about Amelia Earhart. In the photo, labelled “Jaluit Atoll” and likely taken around 1937, a man and a woman stand on a dock. The Jaluit Atoll was under Japanese control at the time, which is relevant to the next detail: the man and woman in question are both Caucasian. As all Westerners had been banned from the island, this is notable, I guess. The Earhart evidence is less so. The woman sitting on the dock believed to be Earhart has her back to the camera. She has a haircut that’s “too long for a man but too short for a native woman” and she’s wearing pants. Amelia Earhart loved pants! 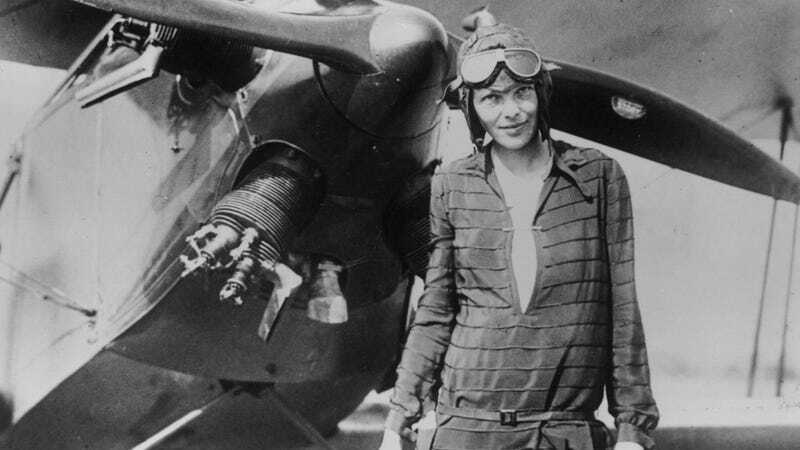 Amelia Earhart, a true influencer, believed in the ease of a lob. According to Gibson, who compared the body measurements from other photos of Earhart to the mystery woman with a fashionable haircut sitting on a dock, the similarities are “striking.” Put that in a blender and pulse for three minutes on high and you have the almost-maybe-confirmed theory that Amelia Earhart was captured by the Japanese and lived out the rest of her life on an island somewhere in the South Pacific. Amelia Earhart survived. Amelia Earhart died. Amelia Earhart crashed into the ocean, made it to shore and lived out the rest of her life alone, away from the misery and pressure of being a famous female aviator and preferring the comfort of pants over skirts and bloomers. Amelia Earhart lived to be 110 years old and died peacefully in the shadow of a banana leaf tree listening to the lapping waves. One or none of these theories is true. She was here! And now she’s gone. But she probably died on an island in the Pacific.